Immigration in the United States is a very hot topic right now. You’ve probably seen the protests due to the current bans on some countries in the Middle East. You’ve probably seen the many hardworking people at the airports trying to bring back in citizens who are a part of this country, but are not allowed in because of their religion and where they come from. If you’re familiar with history or you’re old enough to see what’s happening to our country to know that it’s happened before, then you’re probably feeling afraid if you are even the slightest bit different. It’s a difficult time to be an immigrant, which is why at Zohar Law PLLC we strive to help you by offering as much immigration information as possible. 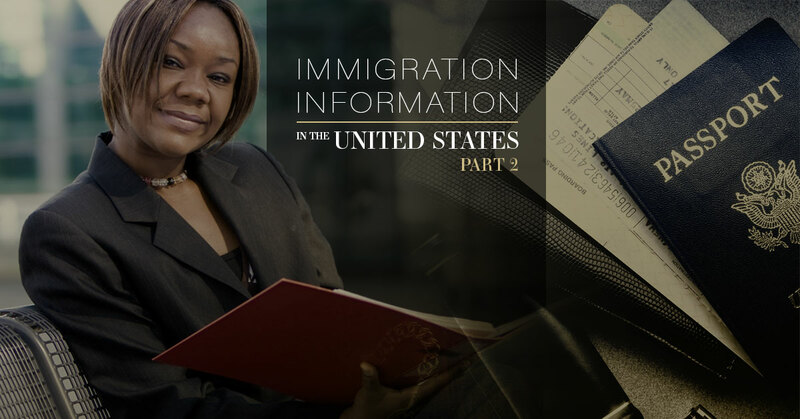 In our last blog, we went over An Overview Of Immigration Information In The United States – Part One, which detailed three points of immigration to consider if you are an immigrant. If you are an immigrant who is in need of information or help, then we can be the law firm you depend on for all of your immigration needs. In today’s blog, we’ll be going over the immigration system and lawful entry. Since immigration is so detailed, we wanted to break up an overview of immigration so we could get as detailed and provide you with as much immigration information as possible. If you’re interested in learning about specific visas we can help you obtain, check out our services. In some of our past blogs, we’ve gone over deportation and what you need to know, questions to ask a lawyer, and went into specifics about the Violence Against Women Act and the Special Immigrant Juvenile Status. If you’re interested in learning more about immigration information, continue reading our blogs or stop into our office and talk to an immigration lawyer. The immigration system in America is pretty complex. There are many different types of visas and ways to obtain citizenship; however, as we’re seeing in America at this time, it can be scary being an immigrant because even if you have citizenship it’s not a guarantee you’re allowed back into the country. By the way, this is illegal and if you’re staying up to date in current events, many people are fighting against the Muslim Ban and trying to get people who are citizens back into the country. The immigration system is run by a body of government that is in charge of the current immigration policy this is called the Immigration and Naturalization Act. The INA helps with lawful entry – which you’ll read about below – and grants visas for people all over the United States. However, in terms of the recent refugee situation, the President and Congress have to determine how many refugees are allowed into the country. When you immigrate to America it is based on a few main points. The first being reuniting families, admitting immigrants with skills to increase the United States economy, protecting refugees, and increasing the diversity in the country. Employment based immigration is a very important factor to moving to the United States. There are many different types of visas to get for both family reunification and employment. For instance, if you have family in the United States you can apply for a sponsorship. If you want to work in the United States, you can apply for a permanent based visa such as a R-1 visa, L-1 visas, or H visas depending on what kind of work you do. Keep in mind that the INA has put a limit on the amount of immigrants allowed into the United States from one country. That number cannot exceed seven percent no matter what. What is lawful entry and what exactly does it have to do with immigration? When a person comes to the United States, there are two ways they can come into the country. When you are a noncitizen, you can take two paths for lawful entry into the country. The first way you can get in is by being granted permanent admission. This status is called the Lawful Permanent Residents or the LPDs. When you come into the country in this fashion you are classified as an immigrant and you’ll receive a permanent resident card. The permanent resident card is also called a green card and it makes you eligible to work in the United States and as time passes you can also apply for citizenship in the United States. Every year at least a couple 100,000 people are admitted into the country through this route. The second path is more of a temporary one. When you come into the country on this path it is on a temporary basis. This means that you can come into the country for a specific amount of time that is limited. Temporary admission into the United States usually is a large and diverse amount of people who are allowed to enter the United States on a specific amount of time. When temporary admission is allowed, it includes touring the country, a diplomatic mission, temporary work, and studying at a school. When you enter the United States with a temporary admission, this is classified as a nonimmigrant. When you are a nonimmigrant, you are not able to be considered for citizenship or naturalization. Consider a temporary admission as a short amount of time you are allowed into the country for a limited amount of time. This means that if you are interested in applying for a more permanent residency in the United States, you need to go through a different process to become a Lawful Permanent Resident. In addition, when you have a temporary admission into the United States, you are limited in the work you can do. Depending on the type of nonimmigrant visa you obtain, you can work for a limited time in the United States before you head back to your country of birth. If you’re interested in obtaining a visa, look at our services to see if we can assist you in becoming a citizen of the United States. Stay tuned in to our blog for all of your immigration information you need to know. For all of your immigration information needs, call (866) 318-0044.